Yesterday’s candle to the usd to cad daily chart may have signalled an end to the recent short squeeze higher and a possible resumption of the continued move lower. Of particular interest was the high of yesterday which failed to break through the 40 day moving average which would suggest this now presents a barrier to any move higher and the bar finished with a deep upper shadow suggesting that the US Dollar bears were once again in control. 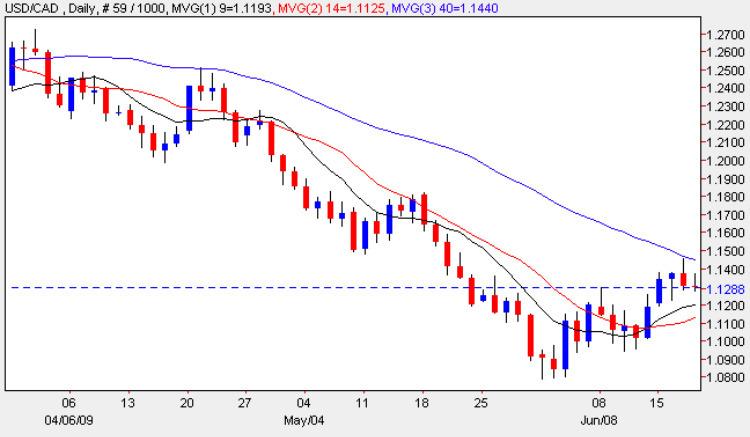 Indeed this price action has been replicated in this morning’s trading as we await a raft of fundamental news on the economic calendar both the US and Canada, and in particular 2 speeches by Bank of Canada Governor, Mark Carney, which are due later this evening. Interestingly the text of his speech in front of the District Chamber of Commerce in Regina, is to be released 15 minutes beforehand. This is followed by a press conference at the same event where a Q&A session is expected. The other main item of news for Canada was the release of Core CPI and CPI, both of which came in better than expected at 0.4% and 0.7% respectively. Meanwhile in the US unemployment claims for the week came in on target at 608k and we now await the Philly Fed Manufacturing Index, CB Leading Index and Natural Gas Storage figures. Details of these can be found on the Eurodollar site.